@kilodelta It's not rescinded. It's now up to driver's judgment. If the official policy is wish-washy enough to be determined at an operator’s whim, I think it sets annoyingly bad precedent for operations policy in general. If customers are taught and permitted to use the rear door after 7pm and then told otherwise when trying to do so, it not only undermines Metro’s relations with the public, but it also makes the bus-riding experience unreliable and unpredictable. It’s a travesty there can’t be stronger consistency in the system with a rule as basic as the 7pm one. Not only do riders want to be assured that they can consistently use the same door over and over again, the very tenets of Metro’s new service guidelines also call for maximizing operational efficiency, something that can be achieved if every operator adheres to the same rules. The driver always has the responsibility to make judgement calls when to allow certain operations. Metro still has bus stops that aren’t long enough to pull in parallel to the curb, or sufficient flat curb space to allow an easy exit on to firm surfaces. I recall the tragedy in Federal Way some years ago where the passenger ended up under the rear wheels after slipping on a slick slope after alighting. Sometimes cars park in the zone that require the driver to block the lane and use caution on exiting the front door. Some drivers have a higher tolerance for risk than others, or some may have had a bad experience using the back doors. But yeah, normally, all doors should be the rule. You’re right on this! It is maddeningly rider-hostile to capriciously change the rules for riding. I’m actually angry to the point of speaking up when (usually a a power-freak) driver disciplines a rider for doing what they think is the right thing. If this persists after September though, Metro will be in deep pain. The only way the end of the ride free area will have any operational benefit is if Metro trains its riders *always* to use the back door to exit. Losing all-door operation downtown will be a fiasco unless they take can make this massive change in riders behavior and expectation, and if they’re still ambivalent about it at this point it suggests to me they don’t understand how important that will be in the very near future. I’m not aware of any avenue for a driver “disciplining” a rider. Can you be more specific? What exactly does this look like, this “discipline”? None of us are “power-freaks”, dude. Some of us take ourselves and situations a bit too seriously; there are those among us who’ve managed to keep their jobs despite poor people skills and a lack of perspective, but seriously – “power”? Not much of that as a bus driver. If the bus driver says “Please use the front door,” there’s likely a reason for it. It costs you a maximum of 60 feet or so of extra walking. There are plenty of times I’ve kept that back door closed for a very good reason. I do my best to explain to passengers why so they don’t feel I’m on a power trip but people frequently don’t hear what I’m saying even when I’m saying it right to them. Yes, but passengers need to know why. Otherwise we don’t know if it’s a specific issue relating to the location, a broken door, or whether the driver is being generally cautious, or on a power trip. Even if the driver just says, “At this stop, use the front door,” it tells passengers that the reason is stop-specific rather than a general application of the 7pm rule. I know I was confused enough when I first moved here that I pretty much always used the front-door for entering & leaving. I still don’t expect to be able to enter by the rear door downtown (mind you, I don’t live or work downtown). I have a Microsoft co-worker that just swipes his MS-provided ORCA on the way in & the way out every time, because he can’t be bothered to figure it out. I couldn’t come up with a complete explanation shorter than 5 minutes. I’m fine with drivers deciding that one door or the other isn’t safe to exit from at any time of day, and it makes sense for it to be the front door that’s safe, if both aren’t. But, it should be the exception, not the rule, and the driver should announce that it’s the case each time. Metro should also be monitoring which stops don’t have all-door access, and working with SDOT, etc. to correct the situation. The RFA is very much on-topic as it remains the sole reason for front-door exiting. There is even remaining cinfusion about how to handle exiting when youb board oin the RFA. At 6:50 and exit outside the RFA at 7:35. Should a passenger in such an instance demand egress through the back door-even if they haven’t paid their fare yet? Plenty of drivers opt to use the front-door-only rule well outside the RFA, and, I’m sure, will continue to do so long after the RFA is out of our misery. When people board within the RFA, it’s appropriate for them to de-board via the front door “well outside the RFA”. And to add to the confusion there’s the issue of RapidRide buses having signs on the outside of the middle and rear doors that say to board through the front door after 7 PM. 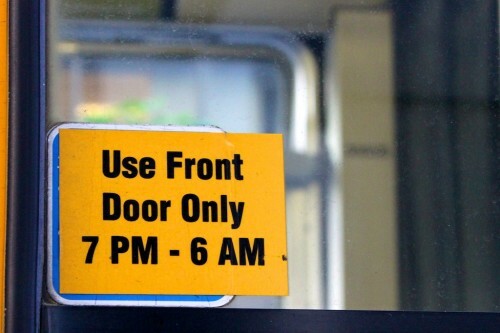 Many drivers, however, ignore this rule and open the back doors at night for people getting on, creating confusion for passengers when a driver enforces this rule and won’t open the back doors to let people on. “After 7pm, use only the front doors for boarding. Customers may alight through front or rear doors”. How in the world do you expect a driver to prevent someone from BOARDING through an open rear door, short of slamming the door on them as they try? Our policy manual says that for RR, board only through the front doors after 7pm. What drivers are doing is opening the rear doors to let people OFF, and people are using those doors to board. Not a damn thing the driver can do about it. In order to get rid of all the 7pm-6am rules, Metro needs to have fare inspectors making random appearances during those hours. Since those are the hours where drivers probably feel least safe, treating RR like RR 24/7 is an investment in safety. I take the B Line a couple times a week, and many drivers are letting people on the back doors after 7 PM even if no one is getting off the back doors. This creates confusion and the slowing down of the line when a driver who does enforce the 7 PM rule doesn’t open the back door to board people. You’ll see people waiting and waiting at the back door, then finally realize the driver isn’t going to open it, then walk all the way to front of the bus to board. Since there is so much confusion about the 7 PM rule, even within Metro itself, couldn’t it be that the person who tweeted this is mistaken, and aren’t up to date on policy? Time to get our hands on The Book. I think the tweeter is wrong. All knowledgeable drivers I know say the rule is backdoor–always (except bus originating in RFA 7pm-7am). and only no backdoor within the RFA, mind you. Bingo. Not to say that there aren’t drivers out there approaching the bottom of the bell curve (lots of avenues for customer feedback on specific issues). But this should be a non-issue at this point; even more so after the end of September. Sam, that is the case. The official policy per both issued memorada and the current policy manual is to allow exiting via the rear doors at all times except in the RFA during Ride Free hours. The kcmetro tweet is incorrect. As noted by others, sometimes its unsafe to exit through the back depending on coach alignment wiith the zone. We have also been asked not to deboard passengers through the rear door at park and ride lots during ride free hours, and it still makes sense to ask passengers to use the front to pa6 their fare after leaving the RFA. Enough is enough. Not just of boarding practices that leave passengers confused and infuriated, but of transit agencies’ chronic inability to get the simplest instructions, from door-use policies to re-routes, communicated to their own drivers. Forget Customer Services. King County residents need to get onto their county council members and also the County Executive, noting time, date, coach number, and direction of travel, with a plain statement that we’ve paid our damned fares, we’re carrying heavy luggage, and we and deserve to be treated with the courtesy due customers in an industry that is fighting for its life. With copies to legal counsel, both passengers’ and the agencies’, about possible consequences of unlawful detainment. Those of us who live in King County and ride ST routes like the 511 have two King County Council representatives on the Sound Transit Board. Most 511 drivers are reasonable about door use, and their passenger-handling skills are excellent. The two I’ve encountered that aren’t, a very short letter in each of their files should bring around. With an expensive public address system at every driver’s disposal, a polite request to come to the front door in the interest of the passenger’s own safety where conditions warrant is certainly in order. Driver’s discretion is indeed about safety and nothing but, period and paragraph. If management’s orders need to say that explicitly, the politicians should so direct. This isn’t what anyone is complaining about, and everybody knows it. As a former full-time driver and current full-time passenger, here’s how I look at it: The way I feel about blatant fare-evasion, that’s exactly my take on being mistreated aboard the service my fellow passengers and I are paying for. And when I’m the only passenger or one of five or so on an empty 60′ two hundred thousand dollar bus, driven by someone making more money than I’ll ever see in my lifetime with medical benefits I could really use: think limousine. To be perfectly frank, complaints in this overheated tone about what is really a minor customer service issue will just get laughed at by councilmembers and their staffers. You’d be far better served by matching the tone to the actual severity of the problem. Re: overheated tone, Counsellor L.,point taken. My younger brother, who was one of Metro’s attorneys back in the pre-merger days when I drove, has always told me the same thing, and council and staff reaction has generally been pretty much as you say. Also noticing that while angry young men have a certain sultry appeal, especially if they play cute vampires in Forks, young council staffers, who really try to please their employers’ constituents, are the only ones who don’t laugh at a furious non-young citizen. Bless them. Elected representatives probably spend so much time being yelled at by enraged people whose seniority gives them life and death power in Congress, or whose donations determine elections, that they could care less if buses even have doors. It’s good you’ve found a profession to replace transit driving. I never did. It really isn’t a normal life- the reason that in 17 years after separating, I’ve never written a complaint on a driver. But like the blues song says, it really was my life. Transit will be with me lifelong, and I’m desperate to see it succeed. And Mike, from my reading of the incident, the driver really was trying to comply with the demand, in a chaotic situation. She couldn’t get the coach pulled over and the door open fast enough. And most likely, whatever she would’ve done, the man who hit her would not have done any different. A driver I knew had his eyesight damaged being hit for reacting too slowly to somebody who really wanted off to attack somebody else. The only way these travesties relate to door policies is that in general,the smoother and more efficiently the system works in general, the less likely it is that trouble of any kind will arise. ….actually, I should have said that ALL assaults on transit drivers are felonies under Washington state law. The one mentioned above caused severe head injuries. I’m very much looking forward to all that cash you’ll never see. My take-home after deductions for union dues, etc. still puts me under the $40K mark. Yeah – um, Mark, buddy. Asking someone to use a particular exit rather than anyone they want hardly constitutes “unlawful detainment”. “Irritating inconvenience”, maybe, but not sure how that stacks up in courtroom cred. The problem with “front door only” be it due to “pays you leave” or drivers mistakenly enforcing the “after 7 rule” is it makes routes very slow when the bus is standing room only. Especially if the driver is one to be a stickler about fare enforcement too. One 70 series trip as especially noteworthy as the driver seemed to be trying to provoke a confrontation with every single passenger. The bus was crush loaded leaving Westlake. She wasn’t opening any door other than the front. She inspected every transfer and made people re-scan their ORCA until it gave the correct beep (the reader was acting up BTW). She got into arguments with everyone with an expired transfer or who was even a little short on the fare. She was also making a point of reminding everyone not to eat or drink on the bus if they had anything that looked like food or liquid on them and in some cases getting into arguments with people when she decided they couldn’t take what they were carrying with them on the bus. Not how conversation goes at my house. Who are YOU eavesdropping on? I’m down with giving operator the option to require front-door egress between 7pm and 6am *if* a politely recorded, nonbelittling message is available to the driver, such as “When exiting this coach during this trip, please exit at the front door” (which can be played periodically) and “When exiting this coach, you may exit at any door” (played periodically) or even “When exiting this coach, you are encouraged to exit at the rear door.” Communication, ney positive communication, is the key. The authoritarian voice that some operators use can scare some riders into never exiting at the rear door again. What’s in the current operators manual about this? Does this constitute “official” policy? It would have been interesting if, before this post was written, Sherwin had talked to different people at Metro to see what their understanding of the back door policy is. Call up rider information … Email the Metro PR rep. … Casually ask various bus drivers … maybe even ask a few riders. Then write the post, sharing what everyone he talked to said. It would be interesting to read all the wildly different ideas on what the people who are supposed to know think the policy is. Actually I think another STB writer covered this (complete with an anwer from Metro) some months ago. I think it was Adam. WordPress search engine doesn’t function too well. The psuedo 7PM rule is stupid. Even my 5 opens back doors before 6am. METRO: GET YOUR ACT TO GETHTER. KILL 7PM-6AM NOOOOOOOOWW!!!!!! Elimination of the RFA will for the most part do just that. There remain issues associated with the RFA that have it making sense to ask people to exit via the front doors. There are also just a lot of stickers out there (it’s a big fleet and I’m not sure that sticker removal is a huge priority) that cause additional confusion. I know. When identify a bus with such a sticker, I take a photo, note the bus number, and send it to Metro. Good plan. There has been a union issue with who installs or removes stickers (I’m not a union guy), which may contribute. Not sure. I have seen this several times. The driver says “Exit at the front door” without explaining why. Sometimes there are particular reasons, like the back door doesn’t work or there’s a gap in front of the door. Other times it seems to be following the obsolete rule. Sometimes I ask the driver why or point out that it’s no longer required to leave by the front door, but often the driver gets irritated at the question. So the result is that different westbound #10 or #11 runs have different policies, for no discernable reason. Metro needs to seriously get over the “front door rule” in September. Usually I would tell you why. But sometimes, especially if it’s because I don’t trust someone standing in or near the zone, I might not. As long as I ask politely, I’d hope you wouldn’t feel too inconvenienced by walking to the front. I’d rather be told than not. I often stand at the rear door, see it not open, and then move quickly to the front, without hearing a word from the driver, lest I get stuck on the bus another mile on a pedestriaan-impassable freeway. Can’t speak for anyone else, but I would have said “Please use the front door at this stop.” I think it would be obvious why, in the case of bad actors with whom I have previous experience, I wouldn’t explain further. “Please use the front door at this stop” makes it clear that this is a specific, here-and-now thing. I usually say “If folks wouldn’t mind, please exit through the front door as the rear door is blocked.” Places this happens quite a lot are 3rd and Pike and 3rd and Main when you’re the 2nd or 3rd bus back, the rear of the coach is some distance from the curb and there’s a vehicle partically blocking the rear door. What is going to happen with rear door existing in the RFA when the RFA is eliminated. You’ll always be able to exit via the rear door? Given that Metro is posting “Front Door Only after 7 PM” Stickers on RapidRide stops downtown, I’d imagine little will change. So we get the worst of all worlds: Force all who have already paid their fares on a fully loaded 60ft bus to exit through only one of two (sometimes three) doors in the busiest portion of most routes. I wonder whether this will have a negative impact on schedules. Especially in the DSTT where all inbound service is mostly de-boarding customers. Is this policy due to a fear of fare evasion? Was fare evasion the reason for getting rid of the RFA? Sounds like a train wreck is coming our way this fall (or is it already here?). There is a legitimate security issue with opening the rear doors at certain stops at night. Many (but not all) of these stops are in the CBD. As a driver, there are certain places where I want to be able to see exactly who is boarding and what they are carrying. That’s for boarding only. Passengers can continue to de-board (Metro policy) via rear-doors. Problem is (for drivers): How do you prevent people from boarding at the rear when you open doors for people exiting? This is a good occasion to go OT a bit, and give some love to those bus riders, for instance on the evening 55, who get out the back of a packed bus, walk up to the front, and pay their fare on exit. Last year I sat next to retired WashDOT boss, Doug MacDonald, and a dozen or so others who paid or tapped outside the Bridge Tavern at 35th/Avalon. Cheers! This is what I ask passengers to do, especially when the bus is crowded. I very often used to open both doors at Harborview driving the outbound 3/4, first making a clearly audible request for those exiting by the back door to stop by the front and pay. I’d say maybe one of every three to five passengers actually paid a fare or showed a pass. To be fair, many people the people who didn’t walk up to the front and pay might have already had passes and decided that since they didn’t actually need to pay, holding the bus up to swipe their pass wasn’t worth the bother. At least for me, when the driver opens the back door while in PAYL mode, I usually don’t bother to go up to the front. Since I already have a pass, it’s not costing Metro any money, so I don’t feel the least bit guilty. Except that their ride doesn’t go into the data count, or revenues redistributed between angencies based on recorded rider patterns. Is it really that much “bother”? Metro knows how many people are usually on a bus at a certain hour in a certain month, and approximately how many walk off without tapping due to bus overcrowding. It’s the same number every year. It’s Metro’s “fault” for not having enough buses that people are so crowded they can’t even walk to the farebox without going outside the bus or waiting three minutes for it to unload… and meanwhile they have to run to another bus that’s at the stop and about to drive away… a situation that’s exasperated because the overcrowding itself often makes the first bus late. If they actually do re-enter the bus and tap, they’d hold up the queue of people trying to exit at the front door… or they can wait outside for the front of the bus to clear, but that’s completely unreasonable. Of course it’s not Metro’s “fault” in the sense that Metro doesn’t have enough money for more buses and drivers: that’s the county’s and state’s fault. There’s a pre-recorded announcement for this now, heard it on an outbound 11 the other day. It specifically says that if the bus is crowded you should get off at the back door and walk up to the front to pay. I’ve had drivers on crowded outbound 43s and 545s suggest the same. Metro has asked us (via memo) to not do this at Park and Rides. Am I the only one who thinks this is much ado about very little? It’s representative of larger problems within the agency, like poor internal and external communication (nobody seems to know the definitive door policy), and poor decision making (see today’s RapidRide news). First one, OK they got it right this time. Second one, sorry, still a crappy decision on RapidRide. Communication on this particular issue internally, at least as far as drivers and management goes, has been pretty good. The policy vook language has been changed, and both Operations and Policy bulletins issued more than once. However, many of the stickervsigns representing the old policy remain, and there are legitimate circumstances (bus left the RFA before. 7n alignment with zonesn blockages and hazards, and security issues. I’ll cite the Book next post. So – it’s still more complicated than just “eliminate the 7pm rule”, and in some circumstances always will be. Metro’s General Manager and other Administrators have made it clear that drivers are expected to use their best judgement. The policy manual is not a set of stone tablets, it’s a set of policies expected to bend to situational necessity. This is not to say that some drivers “didn’t get the memo”, aren’t following best practices, aren’t at times being less accomodating they could be or let’s face it – just having a crappy day and being jerks. Call ’em or web ’em in when you think things fall into the latter category so that driver will have a conversation about policy as well as best practices. Also understand that we deal with complex situations that change from minute to minute – and there may be a reason for something that you’re simply not aware of. In such cases – feel free to ask the driver what’s up if they forget to volunteer the info before passing judgement. Also understand – we don’t put the stickers on the coaches, take them off, or make policy. By the way – most contacts with customer service are complaints when a driver is doing something wrong. FYI it is equally (if not more) helpful to let a driver know what they’re doing RIGHT once in awhile. Those customer service folks take compliments, too. I think folks would understand that message easily enough. During daylight hours, on some routes, the back door light(s) might never be on. At night, in the winter, the light(s) might never be off. But it seems to me that it would be easy enough to set a control switch that the driver to use at their discretion. Some cities have buses with back doors that require passengers to open them. When the bus stops, a green light comes on meaning you can push on the door now to open it. I don’t know if people can open the door from outside; I’ve only seen it used in exit-only scenarios on crowded buses. This is almost like the amber-light system except it comes on too late: you need to know before the bus stops whether to go to the front door. Why automate what can be accomplished by the driver over the PA? This light/announcement system would still have to be activated by the driver anyway. More “seen but not heard” with regard to bus drivers? The advantage of the light is it would tell passengers when the rule is in effect and when it isn’t. An announcement only tells you at one moment, and maybe you couldn’t hear the announcement or you got on after it was made or you’re not sure whether it still applies two or three stops later. Of course, there would have to be an announcement when it’s turned on or offand periodically for those who don’t look at the light or don’t realize it’s there. And of course the driver could forget to turn off the right. And of course it would cost significant money to install the light on every bus, money that Metro could better put to other uses. Maybe some of you are misinterpreting the word “allowed”. That doesn’t necessarily mean everyone is allowed to exit at the rear door. I can see why some would interpret it as meaning drivers are *allowed* to open the rear door. The manual could use clarification if, indeed, it is the intent of management is to allow everyone to exit at the rear door. That said, I still support giving operators the option, and providing the tools (recorded messages) to give riders advance notice on where they can exit on each trip. I don’t see the word “allowed” in the policies quoted. Also, this idea that drivers shoulld have to punch up canned announcements (requiring taking ones eyes off the road and accessing multiple menus) to repeatedly state what folks should be aware enough of on their own (or through other educational avenues) seems a bit much.